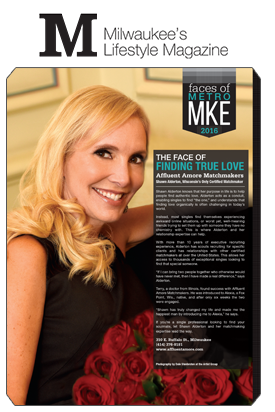 Shawn Alderton is the founder and CEO of Affluent Amore Matchmakers and is currently Wisconsin’s only CERTIFIED professional matchmaker, relationship expert, and image consultant. Her degree in business administration from Marquette University and extensive experience in business development and executive recruiting laid the groundwork for her success in helping her clients find their perfect match. A natural-born matchmaker, Shawn’s passion and sole focus is helping her clients find the love of their life. A Wisconsin native, she has strong Midwestern values and believes strongly in the success that a personalized, professional service can bring in matching and introducing high-quality, exceptional singles. The mission of Affluent Amore Matchmakers is not about finding someone to date. It’s about understanding every individual client’s needs and desires, and matching them with their perfect partner. As a relationship expert, Shawn understands just how difficult it is to meet that special someone, especially given today’s fast-paced lifestyle where time is such a precious commodity. We are the Midwest’s PREMIER matchmaking service and WE WILL connect you with the LOVE of your life. Don’t waste your precious time on disappointing blind dates, bar scenes and online sites. Our personalized and systematic approach is individually tailored to find matches that meet your specific criterion. Our focused executive recruiting search finds the most qualified matches using our enormous FREE database of attractive and exceptional singles. We’re here to help you meet the Love of your Life!